With an early education in weaving, bell ringing and 8 bit computers Dave Griffiths hopes for a future with more long term thinking, and attempts to contribute via the improbable connexion of games design, computer languages for livecoding performance, the reuse and reverse engineering of games hardware and working with artists, biologists, robotics engineers and psychologists to bring this to public attention in various ways. Dave shares these dreams with FoAM, an independent research group with whom he works, and releases all of his work under free software licences. His past work includes research for Sony London Studios, computer graphics for feature film productions and games. He currently lives and works in Falmouth, Cornwall. Newsflash: Naked on Pluto wins first prize 2011 VIDA award! 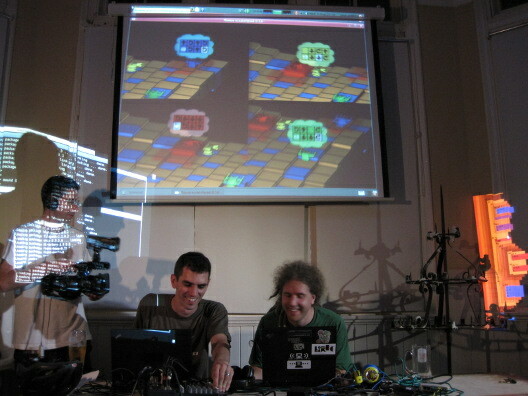 Me (on the right) performing with Alex Mclean and projecting on a BBC cameraman - thanks to Dan Stowell for the photo.